The Proocam Goeasy Plus Pole for Action Camera is constructed of aluminium with threaded locking collars that allow the pole to extend from a closed length of 36cm to a fully open length of 98cm. The collars are rubberised for additional grip even in the wet and the grip is clad in an open cell foam sheath for comfort. 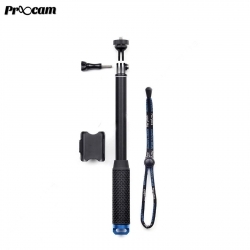 It also comes with a detachable remote holder for your GoPro wireless remote. The Goeasy Pole also features a lanyard loop and landyard to tether your pole to your wrist or a floaty to make sure that your Pole and camera don't wander away from you and also come with a standard mounting thumbscrew as well as an thumbscrew and thumbscrew wrench for when you really need to torque down your camera into a fixed position. Fit digital cameras with 1/4 inch screw. Adjustable design allows random ratation of shooting angle. Installation is easy to complete. Perfect mate of your travel and daily life, recording every meaningful moment of you!